This adapter provides a single-slot bootable storage solution for PC/XT and PC/AT systems. Transform your IBM PC, PC/XT or compatible PC by replacing the MFM or RLL hard drive with a CompactFlash card! 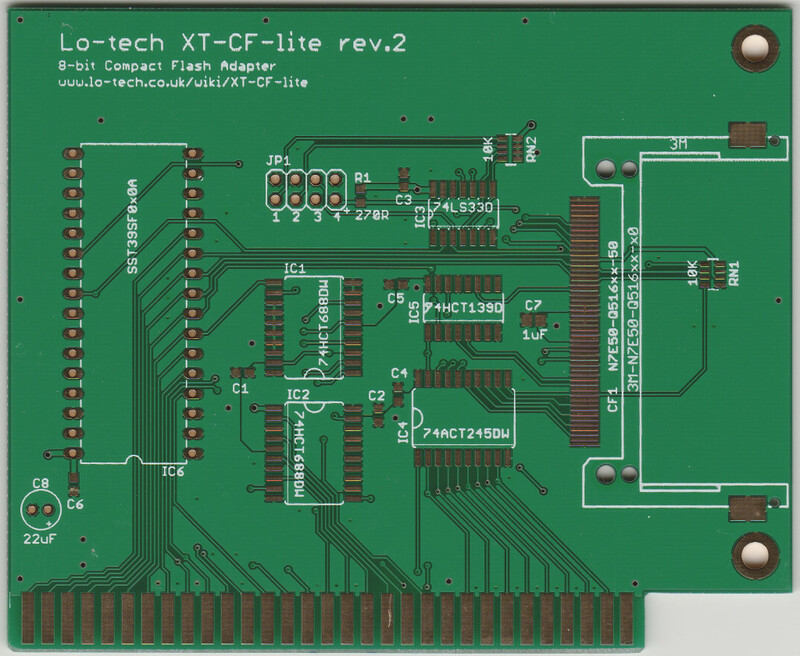 This card provides bootable fixed disk storage and can reach 300KB/s in a 4.77MHz 8088 based IBM PC/XT when used with multi-sector capable CompactFlash cards or Microdrives. See blog entry and wiki page for full details. ENIG finish. Note that this board requires SMT soldering skills – this can be performed with a standard temperature controlled soldering iron with a help of a quality syringe flux and desoldering braid. After construction, the BIOS can be programmed with the card installed in the target host – see product FAQ for details. Note: PCB only. Bill of Materials is provided in the wiki. ISA Slot Bracket can be printed at home or via a 3D fabricator using the STL file available here.